CEDAR FALLS — Paul E. Braun, 74, of Cedar Falls, died at home Monday, May 10. 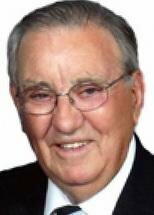 He was born Aug. 27, 1935, in Sumner, son of Edward H. and Marie A. Aschbrenner Braun. He married Darlys Kirchhoff on Oct. 24, 1956, in Tripoli. Mr. Braun graduated from Sumner High School in 1953, and served in the U.S. Navy from 1954-58. He owned and operated B&G Heating from 1970-1990 and was employed with Cedar Falls Utilities from 1990-1999. Survived by: his wife; a son, Scott (Tracey) of Cedar Falls; a daughter, Kimberly (Jeff) Lee of La Porte City; four grandchildren, Brandon Medlin, Alec Braun, Emily Braun and Austin Lee; four sisters, Dorothy (Carlton) Kjergaard of Olathe, Kan., Corrine (Johnie) Heath of Diamond, Mo., Marlys Konrardy of Waterloo and Verena Herrin of Batesville, Ark. ; and a brother, Arlan (Deanna) of Cedar Rapids. Preceded in death by: a son, Todd A.; and two brothers-in-law, Harold Konrardy and Tom Herrin. Services: 11 a.m. Thursday at Ascension Lutheran Church, Waterloo, with private inurnment at a later date. Military honors will be conducted by Cedar Falls AMVETS Post 49. Public visitation from 4 to 7 p.m. today at Richardson Funeral Home, and for an hour before services Thursday at the church. Memorials: may be directed to Ascension Lutheran Church Building Fund or Cedar Valley Hospice. Paul loved spending time with his family, especially his grandchildren, playing golf, and being of service to others. After retirement he was a tremendous asset to Performance Bodies in the Cedar Falls Industrial Park.